Garmin add the portable ‘HUD’ to their range. 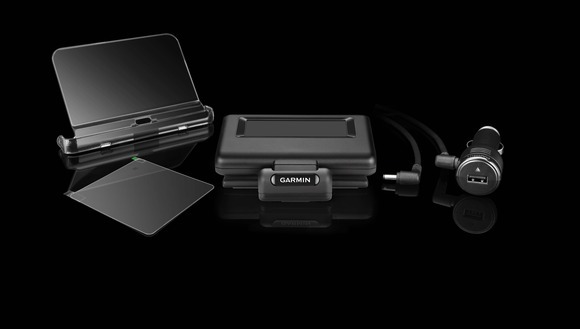 Garmin have expanded their range of satellite navigation systems with its first portable ‘HUD’ (head-up display). Garmin have been the global leaders in GPS satellite navigation systems since 1989 and have won many awards over the years. The HUD projects sharp and bright directions onto a transparent film on the windshield or an attached reflector lens. The HUD receives the information through Bluetooth on a smart-phone running a Garmin StreetPilot1 or NAVIGON app. Projecting the directions onto the windscreen and putting the information in the drivers’ field of vision means they are not distracted increasing driver safety. said Dan Bartel, Garmin vice president of worldwide sales. The directions given will be simple and clear. The displays will show direction arrows, distance to the next turn, current speed and speed limit as well as estimated time of arrival. The HUD will have lane guidance that warns you when the speed limit is exceeded. It will also be able to tell you if there is traffic or any speed cameras nearby. As well as the visual directions there will also be verbal instructions via an app that can be used through the phones speaker or via the cars stereo if connected by Bluetooth. When you need to take a call with a hands free connection the directions will still appear on the windscreen or lens and if you are listening to music it will fade out when the directions are given. The HUD will be compatible with iPhone, Android phone or Windows Phone 8. The HUD has an integrated USB port on the vehicle power/adapter cable making it easier to charge while driving. Garmin have said the HUD will be available later this year but have not given a date. We are looking forward to seeing one in action.